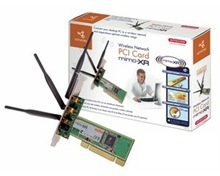 You can connect your desktop PC in no time to your wireless home network with this Wireless Network PCI card. You can then wirelessly share files, peripherals and the internet (you must have broadband subscription and a router). Regardless of whether in the attic or downstairs at living room,enjoy the freedom of wireless networking and surfi ng the net anywhere. Your connection will also be fast enough for wireless sharing of seriously large multimedia files such as digital music and movies because the WL-151 performs with actual throughput speed up to 35 Mbps. Sitecom Mimo-XR is backwardly compatible with the existing 802.11b/g standard.